If you have an old distribution board, it's time to consider upgrading your installations. If your home pre-dates the 1960’s, your electrical installations are likely out of date and not fit for purpose. Older distribution boards are prone to electrical faults and overheating, increasing the likelihood of fire. What is a Distribution Board? A distribution board is a component of an electrical system which houses an assembly of switches, fuses and/or circuit breakers in an enclosure. Distribution boards are also known as a consumer unit, panel board, breaker panel, electric panel or fuse board. An upgrade of your distribution board will more than likely require the installation of a residual current device (RCD). An RCD protects electrical circuits, preventing direct contact electrical shocks. There have been significant advancements in distribution boards since the 1960’s. The design of old distribution boards is no longer sufficient to deal with the number of electrical devices that we use in our homes in the modern day. The safety of you and your family is paramount. 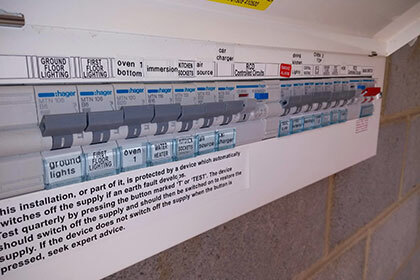 If you have more than one fuse box, a mixture of different boards, visible cast iron switches or a wooden back…You need to upgrade your distribution board. Since 2005, all domestic electrical work must comply with part ‘p’ of building regulations. Part ‘p’ refers to legislation that ensures domestic electrics meet with current health and safety requirements. In order to comply, a professional must install or test all electrical work. This does not legally enforce you to update your existing distribution board. However, if you are adding to your current installations or making significant changes to your electrics, is essential that you consult an electrician to ensure you are legally meeting building regulations.